Carly joined our team in October 2005. She successfully followed the VN course and became a fully qualified RVN in January 2009. 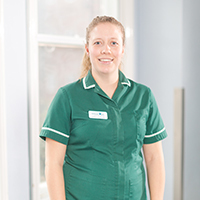 Carly is a member of the Senior nurse team responsible for running the Nurse Clinics, Nurse Training and Puppy Parties. She also has main responsibility for the practice laboratory. She has a little dog called Tess. She now has a young dog called Rupert who is a roan Cocker Spaniel and also a cat called Millie. Carly got married to husband Ben in 2017 and is now Carly York.